ODEON's luxurious finish and deep rich texture is the result of an old world, artisanal technique where a textured felt surface is used in the paper making process. 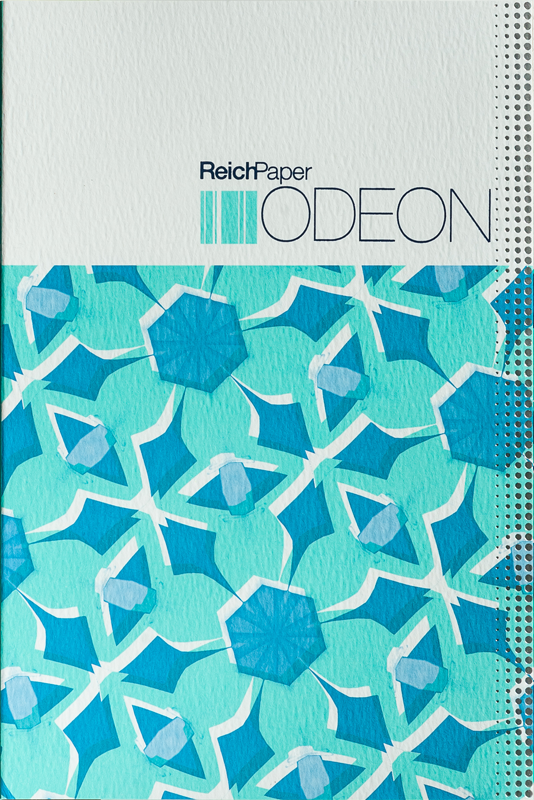 Most papers today are embossed to look handmade, while ODEON is a genuine-felt finish paper which makes it very strong and durable, yet soft and flexible, where even the 130# single-thick cover folds with ease. ODEON performs beautifully on press making it the perfect choice for projects from luxury packaging and hang tags to invitations and direct mail. ODEON is FSC® certified. It is recyclable, biodegradable, acid free, and elemental chlorine free, and is manufactured without the use of metals or foils. ODEON is a genuine felt-finish paper, with deep, rich texture. ODEON is FSC certified, recyclable, biodegradable, acid free, and elemental chlorine free, and is manufactured without the use of metals or foils. The ODEON line is comprised of four surface-enhanced (pearlized) colors, and two standard colors, all featuring a true-felt finish. ODEON will perform beautifully when used as recommended. As with all papers, it is essential to consult your printer and pretest before trying anything new. Please contact us to request samples or discuss any aspect of your project. Caliper is a measure of the thickness of a sheet of paper (1 pt. = 1/1000 of an inch). Below is a list of basis weights and corresponding calipers for ODEON. 84# Text 135 7 pts. 94# Cover 255 14 pts. 118# Cover 320 18 pts. 130# Cover 350 20 pts. Genuine Felt Finish: Genuine-felt papers, also called true felts, are manufactured using fabric blankets on the wet end of the paper machine. Genuine felts like ODEON typically have a slight difference in finish between the felt and the wire side, and this is to be expected. Additionally, text-weight felt finishes will always differ somewhat from cover-weight finishes; this is because the felt marking blankets cannot press as deeply into the thinner text-weight stock as they can into the thicker cover stock. Please note that two ODEON colors, Gala and Vintage, both feature a felt finish on one side only; the other side is smooth. All other colors in the ODEON line have texture on both sides of the sheet. Compared to embossed-finish papers, which are extremely compressed, felt-finish sheets are somewhat more absorbent, as well as more dimensionally stable. Offset: Cosmo, Deco, Patina and Smoke all have pearlized surfaces, which will show through most printing inks. Please note, however, that heavy ink densities may somewhat diminish the effect. The other two colors in the ODEON line, Gala and Vintage, both feature a traditional felt-finish surface. Inks: The entire ODEON line may be printed using standard offset inks. As the pearlized surfaces of Cosmo, Deco, Patina and Smoke are somewhat “sealed”, these sheets will absorb less ink than Gala and Vintage, and therefore may require slightly more time to dry, though the difference should be minimal. Fully-oxidizing inks or UV-curing inks are also suitable for use on ODEON (as they are for all papers), and will provide faster drying results than standard inks. Laser: ODEON 84# text and envelopes are suiitable for laser printing. As for for any paper or envelope, pretesting is essential as performance may vary from one printer to another. Ink Jet: ODEON 84# text envelopes are suitable for ink jet printing, but results may vary from one printer to another. As always, it is important to pretest on the actual printer to be used. Grain Direction: Our paper stock charts list all sheet sizes with grain direction last. As for all papers, binding and folding ODEON parallel to the grain direction is always recommended. Dot Gain: Printing on felt-textured papers will result in greater dot gain than printing on smoother, harder papers. This is to be expected, and prepress file preparations should take this factor into account, adjusting dot size and ink densities to compensate for the increased dot gain. Line Screen: In general, line screens ranging from 150-200 are used for printing on ODEON. It is always advisable to consult with your printer to determine the appropriate line screen for your project. Storage & Handling: As for all papers, avoid exposing ODEON to extreme humidity or temperature conditions, and keep in the original mill wrapping as long as possible prior to use. Spray Powder: Use a coated spray powder of normal fineness, and stack in small lifts. Airing the stack will be beneficial for ink drying, especially for ODEON’s heavy cover weights. Scoring & Folding: All ODEON weights (84# text, 94# cover, 118# cover and 130# cover) should be scored prior to folding, to ensure the best possible fold. As for all papers, folding with the grain direction is preferred. We recommend a rounded channel score with a minimum width of 2.5 times the caliper of the sheet. ODEON is a single-ply (not pasted) sheet, making ODEON cover weights ideal for converting and packaging applications. Please contact us if you have any questions about the Printing and Use information included here, or need information about any other topics. ODEON is a specialty paper and, like any substrate, should be fully tested prior to use, especially if trying something for the first time.